Rachel Roy pre-fall 2013 is the perfect combination of sleek fashion sensibilities and ladylike fabrics and detailing. Roy's interest in developing countries, including Kenya and Haiti, was shown through artisan detailing such as gold plate embellishments. I'm kind of dying over every look above. See more Rachel Roy pre-fall 2013 on style.com. 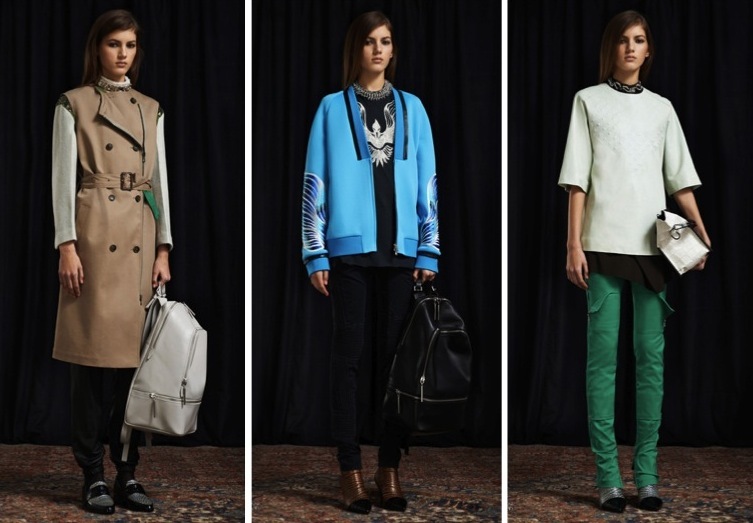 The pre-fall 2013 3.1 Philip Lim collection channels downtown cool girl with an uptown girl sensibility. Lim was inspired by vintage Harley Davidson, which can be seen through his use of the phoenix emblem and paneled skinny pants. His signature sweatshirt dressing also made a strong appearance and I anticipate seeing them on fashion trendsetters such as Taylor Tomasi Hill. See more 3.1 Phillip Lim pre-fall 2013 on style.com. Are as twisted as me and already anticipating next fall's fashions? Do you have a favorite pre-fall collection? Why do they do this to us! Not fair...love the Rachel Roy looks! Love the looks. Very inspiring! Especially the first work one. Right there with you on the obsession! The sweater sleeves of the trench are so unigue! Love the collection! Love it all! So fab. Let me just say that the Pre-Fall collections all looked amazing ! But that 3.1 Phillip Lim is beautiful. Lovely collections. First collection in " Work" category is fabulous. Thank you for the comment, following you now!